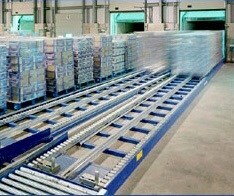 In response to ever-growing demand for automated shipping, Loading Automation, Inc. introduces the ATLS (Automatic Truck Loading System), the world's first fully automated system designed for installation on a regular shipping dock, allowing regular, non-modified trailers to be loaded with pallets, slip-sheets, racks and other types of unit loads. 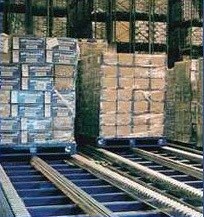 One ATLS unit can service an unlimited number of doors, loading up to 120 pallets an hour in every possible load pattern. Its compliant guiding system allows it to automatically accommodate trailers of all lengths, widths and elevations. 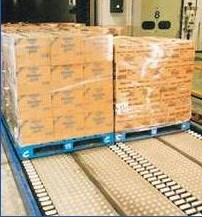 The Loading Module (LM) is a robotized lift-truck that enters trailers to deposit loads. It is equipped with a standard dual lift-truck front-end that enables it to load the full width of the trailer in a single trip. The LM is mounted on a transfer platform that travels sideways, allowing it to transfer from dock door to dock door. Once the platform has aligned with the appropriate door, it detects the presence of a trailer and measures its length to optimize the load pattern. Unit-Loads are brought to the LM by an overhead feed conveyor that runs above the dock doors, keeping docks clear of obstacles and available for lift-truck and pedestrian traffic. If need be, the ATLS can automatically move out of the way and, since the system requires no modifications to the shipping docks, these same docks can still be used by lift-trucks for receiving. In addition to significantly reducing the manpower required on the docks, the ATLS eliminates product damage in shipping, accidents and ergonomic injuries related to lift-truck operation. Also, since it is not battery-powered, it generates substantial energy savings and eliminates costly battery maintenance. With all of these incomparable features, the ATLS is, without a doubt, your key to a safer, faster, more cost effective and accurate shipping operation. Contact us today and we will help you analyze the adaptability of the ATLS to your specific operation.